Customer experience is best when personal. Creation of unique experiences should anticipate customer behavior. Transformative customer acquisition and revenue growth depends on how fast users can get to your products and find what they are looking for. Site speed is crucial in search engine ranking. The competitive world of retail depends heavily on high performance applications that present the right offer to the right demographic at the right time. Redis is a popular choice in the retail industry for numerous high performance use cases such as highly personalized interactions, caching recent views and purchases, inventory and product updates, user session management and analysis, custom pricing, location based recommendations and high speed transaction management. Modern ecommerce platforms and retailers rely on Redis due to its extreme throughput and low latencies, its versatility and simplicity of deployment, and broad community engagement. Redis Labs has further enhanced Redis’ attributes of performance, availability, and scale to meet the rigorous demands of the retail industry. 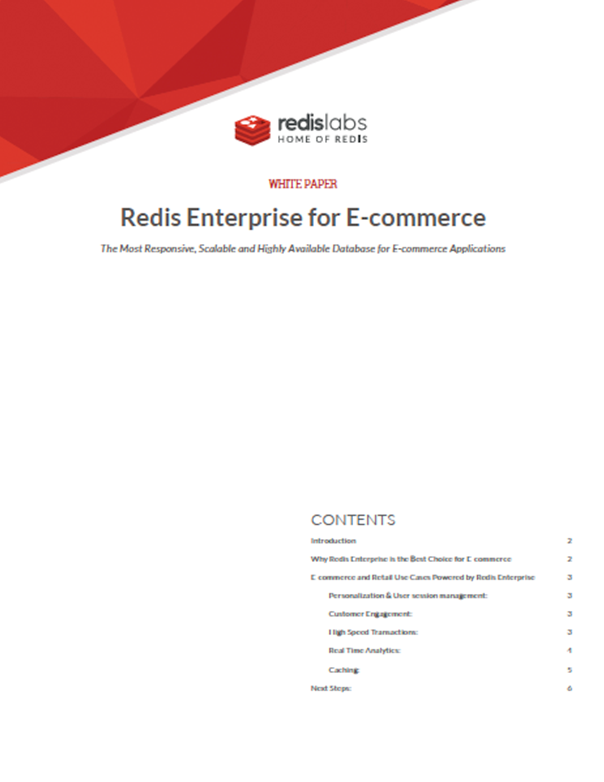 Learn how E-commerce/Retail applications use Redis extensively for use cases ranging from personalization, caching, messaging, user session management and location based recommendations, for its blazing fast performance, simplicity and versatility.